Pluto was part of our Planet Family for a long time, as the 9th planet in our Solar System since its discovery in 1930 by Clyde Tombaugh.1 However nearly eight decades later in 2006, Pluto was reclassified as a dwarf Planet by the International Astronomical Union (IAU). One of the reasons for this is that it does not meet the criteria, specifically “clearing its own neighbourhood.” This means that Pluto has become gravitationally dormant; there are no other bodies under its gravitational influence other than its own satellites.2 Pluto is now considered to be just one of many Dwarf Planets found in the Kuiper Belt. The Kuiper Belt is a large region of asteroids and other debris in the shape of a ring outside the radius of Neptune’s orbit. Pluto is one of the largest Dwarf planets in the Kuiper Belt. This paper will discuss all the findings on Pluto, and the technological advances that brought about these findings. This paper will also unpack NASA’s New Horizons Missions, its instruments and new discoveries. The New Horizon’s mission was launched with the intent to expand our very limited knowledge about Pluto and what lies beyond. The mission was launched on January 19, 2006.3 NASA sent out a spacecraft with various instruments to lead the path for the uncovering of the mysteries of the Kuiper Belt. The spacecraft was equipped with seven instruments, each with a distinct task that allows the spacecraft to explore things individually: Ralph, Alice, REX, SWAP, PESPSSI, and SDS. An astonishing discovery is credited to Ralph which revealed that Pluto possesses blue skies, as will be discussed in the next portion. Ralph is an infrared and visible imager that can take coloured pictures and thermal maps.4 The New Horizons mission’s aim is to map the surfaces and study the composition and geology of what many space scientists consider a double planet. Pluto-Charon is the double planet they are referring to because they are viewed to be so close together, scientists term it a double planet.5 This mission was ranked the number one priority mission in the entire NASA organization, as a result of the many questions and few answers we have about the Kuiper Belt. Success of the New Horizons mission will shed light on a not so new class of bodies in the solar system, but a newly explored class of bodies – dwarf pants, and will provide other valuable contributions to planetary science such as what other dwarf planets consist of, if they also have moons orbiting around them, or if we will eventually be able to find our 9th planet.6 In 2015, the spacecraft reached the newly reclassified dwarf planet, Pluto. 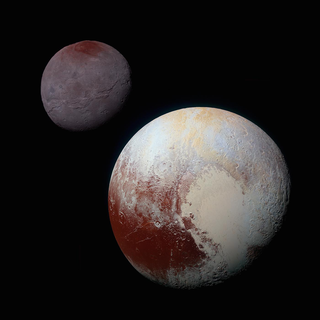 Through its first mission to Pluto, we have learned that Pluto is a little different. Pluto is only about two-thirds as wide as Earth’s moon and its surface is one of the coldest places in the solar system at roughly -225 degrees celsius.7 Pluto’s surface is covered mostly by nitrogen and methane and is also covered in an abundance of methane ice and mountains that reach as high as 3352 meters and those are just some features that makes Pluto different than the rest of the planets included in our Solar System.8 From the images captured, it shows that Pluto’s atmosphere appears blue in colour. Some people questioned the composition of Pluto’s atmosphere, but as New Horizons has confirmed, the sky is in fact blue. 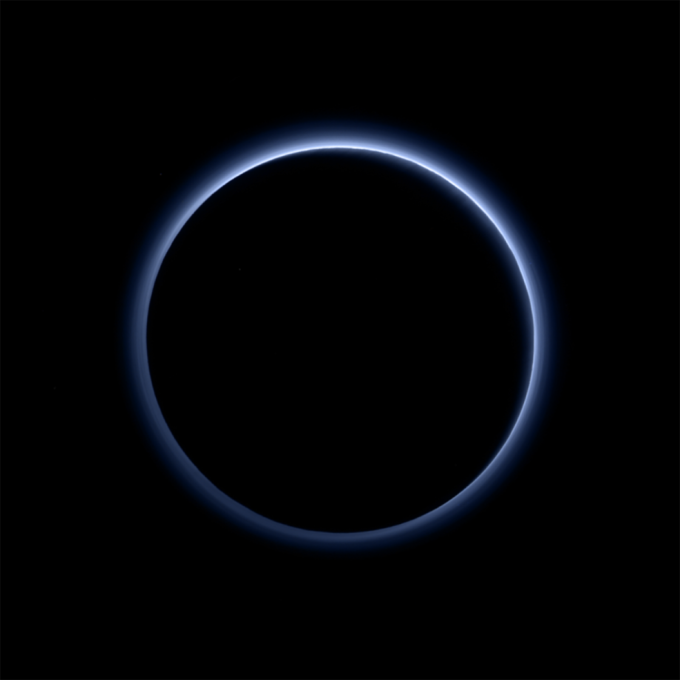 Pluto’s Blue haze is very similar to Neptune’s, Uranus’, and Earth’s atmospheres. The particles that make up the atmosphere the atmosphere and produce this haze are tiny particles which are mostly N2 with trace amounts of CH4 and CO and these particles are most likely to be grey or red in colour,14 and result in a blue colour from scattering of light of these very small particles in a way that makes it so distinct. The New Horizons mission has provided us with many things; the first ever high resolution images of Pluto’s surface, data on its temperature, and data on its atmospheric composition. All of these discoveries have only been possible thanks to this spacecraft making the journey out to the dwarf planet. 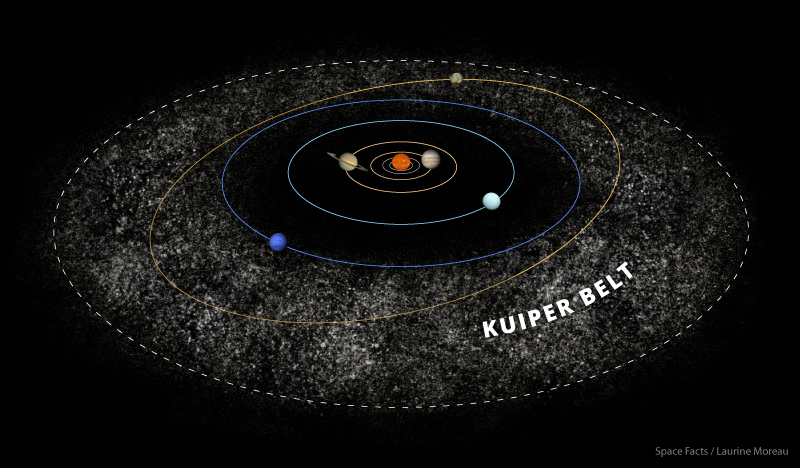 The Kuiper Belt was only suggested in the 1950s, a time where this mission would have been unheard of. Now, thanks to the launch of New Horizons in 2006, the New Horizons team has made all of these observations and discoveries. Pluto may not formally be classified as a planet anymore, but that does not change its significance in the context of the rest of the Kuiper Belt Objects. Questions such as the origin of water in the inner solar system are still being examine by the New Horizons Spacecraft. A. Stern, “Journey to the Farthest Planet.” Scientific American 286, no. 5 (2002): 56-63.3. Schilling, “Long Trek to Solar System’s Last Frontier Begins.” Science 311, no. 5758 (2006): 172. Charles Q. Choi, ”Dwarf Planet Pluto: Facts about the icy former planet, https://www.space.com/43-pluto-the-ninth-planet-that-was-a-dwarf.html. 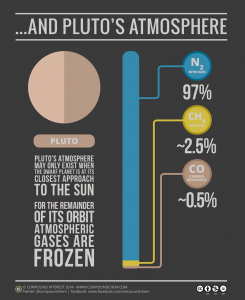 Nola Redd, “Does Pluto have an atmosphere” space.com, February 20, 2016. “Windows to the Universe,” https://www.windows2universe.org/pluto/pluto_composition.html, Acessed March 30, 2017. Samantha Mathewson, “Planet Nine Could Be Our Solar System’s Missing “Super Earth,” https://www.space.com/38431-new-evidence-planet-nine-existence.html.